Instant Pot eggs are one of the most straightforward recipes to master using the pressure cooker function. 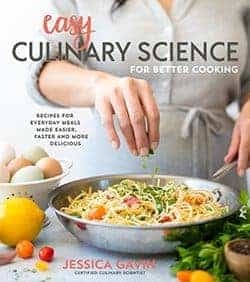 This guide shows you how to make perfect hard boiled or soft boiled eggs in 5 minutes or less using a multi-cooker device. No matter if you’re an electric pressure cooker pro or rookie, making Instant Pot eggs is simple to learn and requires just two ingredients. After experimenting with making hard boiled eggs on the stovetop using the boiling or steaming method, I was excited to give the multi-cooker a try. Add this method to your egg cookery arsenal immediately! It requires only one cup of water to build up enough steam to quickly make perfectly cooked eggs. The significant wow factor is how just a two-minute difference can yield a runny golden soft boiled egg versus a creamy yellow yolk for hard-boiled eggs. Making soft or hard boiled eggs in the Instant Pot may become your new favorite recipe! Below are the critical steps to achieving the right texture and making egg peeling a breeze. Wire steamer rack or something similar. Set-up: Pour water into the pot, place the rack inside, and evenly space out the eggs. The metal rack elevates the eggs above the water so they can steam efficiently once the pressure has built up. The rack that comes with the Instant Pot only fits 6 eggs in a single layer. However, if you want to cook more at one time, there are stackable egg steamer rack trivets that you can purchase. Cook Time: The exact minutes of cook time makes a huge difference. Cook the eggs using the “manual” setting on “high pressure.” Pressure cooker soft-boiled eggs require 3 minutes. Hard-boiled eggs need 5 minutes. Pressure Release: A quick release of the pressure is used for soft boiled eggs so that the temperature can swiftly drop down and not overcook the eggs. A 5-minute natural pressure release is used for hard-boiled eggs, then manually releasing the rest of the pressure. Immediately chilling the eggs in an ice water bath is crucial. It shocks the eggs, similar to the method I use for green beans, to immediately stop the cooking process. This step ensures that the egg whites don’t get too rubbery, and the yolk inside is either runny or solid. Chilling the eggs also helps with the peeling process. Cooking eggs in the Instant Pot makes it easier to remove the shell. The hot steam that’s generated in the pressure cooker makes the egg white proteins bond together, pulling away from the membrane that is in between the white and shell. Make sure that the eggs are completely cooled before peeling. Crack all sides of the egg, and peel away! It can help to run cold water over the eggs while peeling to pull away from the shell and clean the surface. Hard-boiling eggs in the Instant Pot yields evenly cooked soft whites and opaque yellow yolks that easily crumble. This recipe makes for a great snack, or chop them up for egg salad sandwich, or make a deviled eggs appetizer. Soft-boiled eggs are a thing of beauty! The golden runny yolk is so rich in texture, perfect for breakfast, or adding on top of a piping hot bowl of ramen! Overall Instant Pot eggs are easy to make and use little energy and water. Compared to the classic boiling technique or steaming, they all provide easy to peel eggs with smooth surfaces. However, depending on how long it takes for the Instant Pot to come to pressure, the variability of how the yolk will be cooked is a little higher, making each minute crucial for texture development. This is why I use quick release function on the Instant Pot instead of natural release so that there is a better chance for the texture of the eggs to be where you want it. The stovetop methods give you more control and consistency over when you can start and stop the process. You may also notice that pressure cooker egg whites are slightly more robust due to the increased temperature and speed. So far I’ve had success and would recommend giving the Instant Pot method a try. Let me know how it goes for you in the comment section below! How Does Pressure Cooking Eggs Work? Cooking eggs in a pressure cooker simulates steam heat cooking but at even higher temperatures. The cold water added to the enclosed pot heats very quickly under pressure, and the temperature rises above boiling point to between 220 to 250°F (104 to 121°C). This quickly cooks the egg white proteins, rapidly causing the egg white to shrink down away from the membrane and shell, making the eggs easier to peel in most cases. 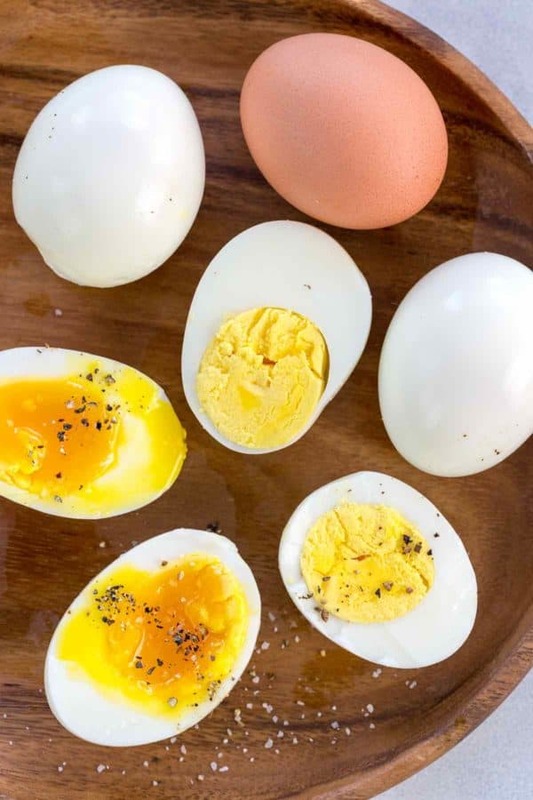 Instant Pot eggs guide shows you how to make perfect hard boiled or soft boiled eggs in 5 minutes or less using a multi-cooker device. Place the wire steamer rack insert in the bottom of the Instant Pot. Place the rack in the bottom of the pot. Equally, space and place the eggs on top of the rack. Place lid on Instant Pot and close. Make sure the steam release handle is positioned to "Sealing." Press the "Manual" setting on "High Pressure." Use the "- or +" button to adjust the time to 3 minutes for soft-boiled eggs or 5 minutes for hard-boiled eggs. Meanwhile, make an ice water bath by adding 4 cups of water and 4 cups of ice to a medium-sized bowl. Set aside. Once the display indicates "On" and begins the countdown at "5," and beeps when the cycle is complete. Press the "Keep Warm/ Cancel" button to turn the Instant Pot off. Immediately "Quick Release" the pressure for soft boiled eggs, or natural pressure release for 5 minutes for hard boiled eggs. Cover your hand with an oven mitt or towel to carefully release the pressure from the pot, sliding the steam release handle to the "Venting" position, releasing all of the steam until the float valve drops down. Carefully open the lid. Use a spoon to remove the eggs and add them directly to the ice water bath. Allow to chill for 15 minutes. Lightly crack the side and bottoms of the eggs and carefully peel the eggs. Eat immediately or store in an airtight container for up to 3 days. Wow so many interesting things to learn and do. Eggs are great and no carbs. I always enjoy your list of the tools you use too Jessica. So happy that I can help you Judy! Made hard cooked eggs in instant pot—peeled eggs have whites that have a tan color rather than white?? Did I over cook them or is there some other issue?? Plan to make egg salad sandwiches and am not sure if I should use the eggs?? Hi Susan- I haven’t experienced the tan color when making them in the instant pot. How fresh are the eggs? Do they taste ok? Since you are adding them to egg salad I’m not so concerned with the color, but if the eggs are fresh. Super delicious! I was able to cook and peel the eggs much quicker than the old method of boiling them. 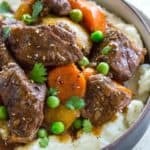 I just bought my instant pot and have been looking around for recipes. Thank you so much for sharing both cooking times. 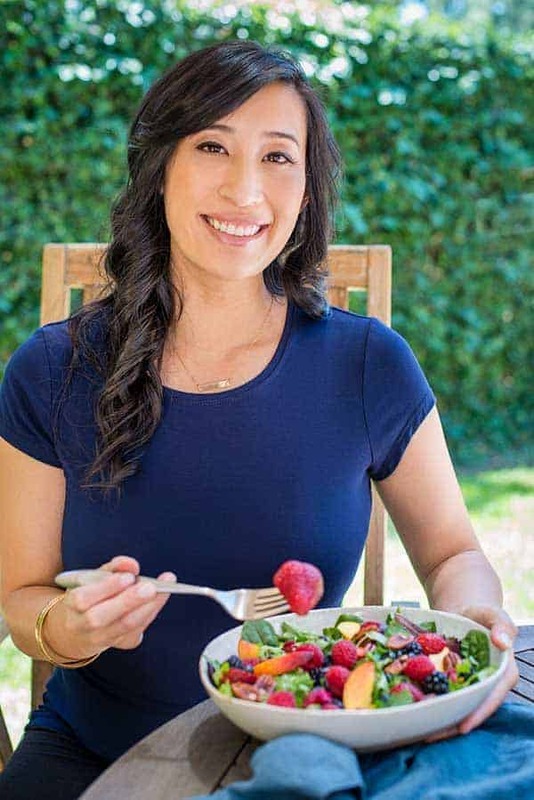 So happy to hear that you had success with the instant pot hardboiled egg method Erin! Your recipe calls for 1 cup of water in the Instant Pot, but I have an 8qt model that stipulates a minimum of at least 3 cups of liquid. Is your 1 cup based on anything in particular or is it the minimum for your size of Instant Pot? Hi Sam- I have a 6-quart size, so my minimum is 1 cup. I would try to modify for your larger instant pot size with the 3 cups and use the same amount of eggs and timeing unless you have a stacker insert where you can cook multiple eggs. I followed your directions exactly for hard boiled eggs in my 6-qt Instant Pot — 1 cup water, rack, cold large eggs, egg placement, manual 5 minutes, quick release, 15 minute cooling in ice water. What I got was eggs with gelatinous centers, definitely not hard boiled. Thank you for your feedback! Did they seem more soft boiled? I haven’t had issues when making them hardboiled, but perhaps you can try to allow it to natural release for 5 minutes, then release the rest of the pressure, and see if that helps? Let me know if you give that a try! Mine were soft also. I think the step of 5 minutes natural release is missing like I see in other recipes for eggs on the internet. Eggs came out perfect! Just tried one to make sure they were ready for coloring.